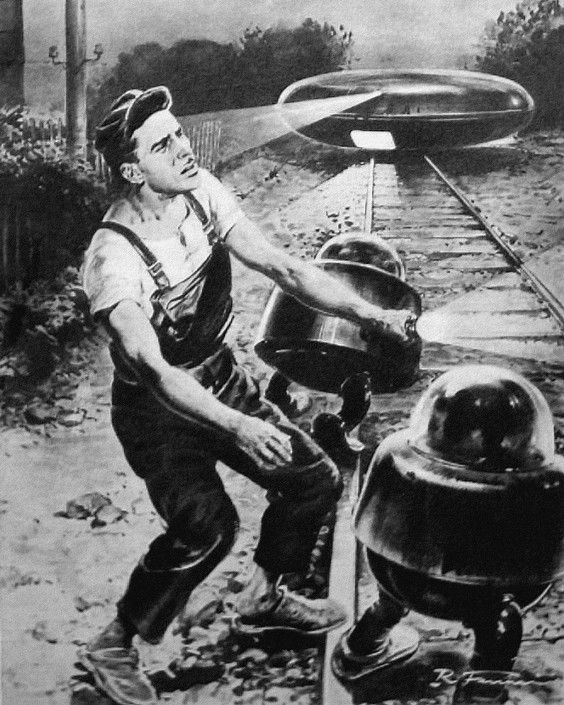 France -> Back in the 1950’s in Northern France a railroad worker, Marius Dewilde, reported seeing two Martians exiting their ‘cigar shaped space-craft,’ and clad in, what he described as, deep-sea diving gear. When Marius approached the Martians, they shot at him with guns that emitted a green beam that paralyzed him. The news of this spread down to Châteauneuf-du-Pape in the southern Rhône where winemakers became agitated at the thought of Martians landing their spacecraft’s in their vineyards. The Mayor thus issued a law forbidding all alien spacecraft’s from flying above Châteauneuf-du-Pape or from landing. This law is still on the books today! 2017 Chateau de La Greffière Macon La Roche Vineuse (Burgundy, France) | Try a full-bodied Chardonnay after surviving an extraterrestrial encounter! This is from winemakers Isabelle and Vincent Greuzard who aged this wine in a mixture of old and new barrels. It has notes of lemon curd, vanilla, and pear. 2017 Château Fontanès ‘Les Traverses de Fontanès’ (Languedoc-Roussillon, France) | Down in the Languedoc-Roussillon, winemaker Cyriaque Rozier makes Cabernet Sauvignon that is as charming as the man himself! The grapes were hand harvested before being aged 6 months to a year in stainless steel. This Cabernet Sauvignon is a bottle of luscious cherry, raspberry, and black pepper notes. Australia -> Each country has that problematic pest that disrupts their vineyards but none are as tall as Australia’s unique pests: kangaroos. These marsupials like to hop around vineyards and munch on leaves-sometimes knocking grapes off their vines in the process! Occasionally, when grass is scarce, they have even eaten grapes. Domesticating these furry and bouncy animals is difficult; kangaroo fencing is possible but expensive, since it has to be a whopping 6 ½ feet high! 2014 Pyren Vineyard ‘Broken Quartz’ Shiraz (Victoria, Australia) | There’s nothing like a Shiraz to warm you up on a cold night. Organic winemakers Brian and Kevyn Joy have been making wine since 1999 on their 70 acres of vineyards west of Melbourne. Their Broken Quartz Shiraz is hearty with notes of salty meatiness, plums, and cracked pepper. Maine, USA ->In the fall of 2018 a redheaded wine nerd named Molly was doing a harvest apprenticeship at Oyster River Winery in Warren, Maine. One night when sleeping in an upstairs loft, while grapes cheerily fermented down in the barn’s wine cellar below, Molly heard the barn doors slowly open below. Assuming it was Brian (the winemaker) checking on his grapes, Molly tried to go back to sleep and ignored the groaning noises, clanging, and flashes of light coming from the cellar. The next day Molly asked Brian what he had been doing with the grapes at 4:05AM, and it turns out no one had been in the cellar! After further thought, Brian deducted it must have been Harold. Harold, was the former deceased owner from over 50 years ago, who died in the barn one night. Brian said that he occasionally likes to check on the wine every so often in the cellar. His ominous presence has been so frightening that previous wine apprentices have even fled to the main house in terror! 2018 Oyster River Morphos Pét-Nat (Maine, United States) | This natural pét-nat isn’t haunted as Harold but is as wonderfully weird as Oyster River. Brian and Allie Smith’s Morphos is a blend of Cayuga and Seyval Blanc that was fermented with native yeasts. It has notes of peach skin, brininess, and grapefruit.